Creating a good learning environment at schools is key to helping students learn more efficiently. By getting wholesale tablets, you are able to give a young person access to thousands of educational apps. Students become more motivated by lesson plans that are used on tablets over ones that are taught straight from the textbook alone. Literacy can be improved more quickly with the help of the voice recorder. The battery should last all day so the student can focus on their work with no pressure, as well as have the complete mobility to move about in the classroom or anywhere on campus. A tablet is an exceptional device geared toward any age. Students with disabilities can really benefit from such a device with specific lesson plans just for them. The future is now, and technology helps students achieve their academic outcomes with more ease than ever with the right tablet. Tablets are needed throughout hospitals everywhere today. They not only help doctors with their daily routines, it is also such a great way for the patient to help better understand the elaborate medical terms that are used to describe what is going on with them medically. Promoting bedside friendliness is a must; doctors can now more easily help a patient feel better just by having the access to more simple terms to express to the patient why their body is feeling the way it does. X-ray images can be shown more easily; it makes the world of a difference when the patient is comforted with clear information by their doctor. Doctors can use a tablet to access medical histories in emergency situations no matter where they are in the hospital rather than wait for the nurses to bring up the correct information that can lead to catastrophic results otherwise. It will save precious time. The tablets can be fully synchronized with the hospital’s EMR. 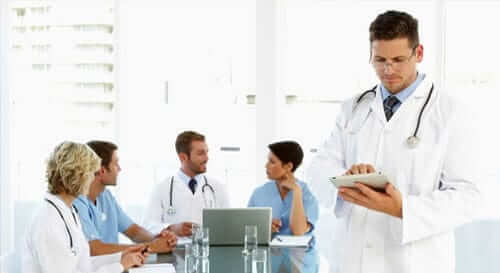 The cost of overages will drop at a great rate just by purchasing tablets for the healthcare professionals. There are hundreds of thousands of medical apps at the disposal of doctors and medical professionals. Tablet usage is redefining how hospitals operate, and changing the way patients view healthcare. Cost is huge factor when it comes to purchasing electronics for a whole office. 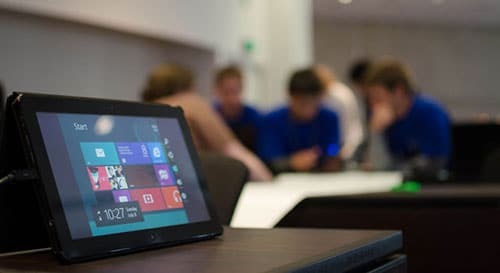 Tablets’ low purchase price makes them more attractive, and with their ease of use, it means they will help reduce support and training costs. For a business’ sake, tablets can truly deliver a remarkable productivity boost. Employees will feel more valued over ones that have to lug around a huge and old laptop everywhere. The tablet acts just like a smart phone, meaning it is always on, and will wake from sleep without waiting for information to pop up. They are super portable as well as use an integrated wireless networking system. They can run apps that are specifically designed to speed up common tasks such as note taking, date entry, and reporting from site visitors. It will be a happy change from a papered filing system. Sales staff can access CMR software, email, and calendaring, and do so in a way that is completely acceptable in meetings over pulling out a huge laptop. Executives can write reports, communicate, build models, delegate, and sign off documents. The options are endless. Tablets naturally thrive in all different types of environments. They are great for education, in public sector organizations, and in healthcare. The tablet can integrate with your business’s other systems for easy access. The benefits are clear: convenience, ease of use, flexibility, and security. The tablet gives businesses the power to do more.